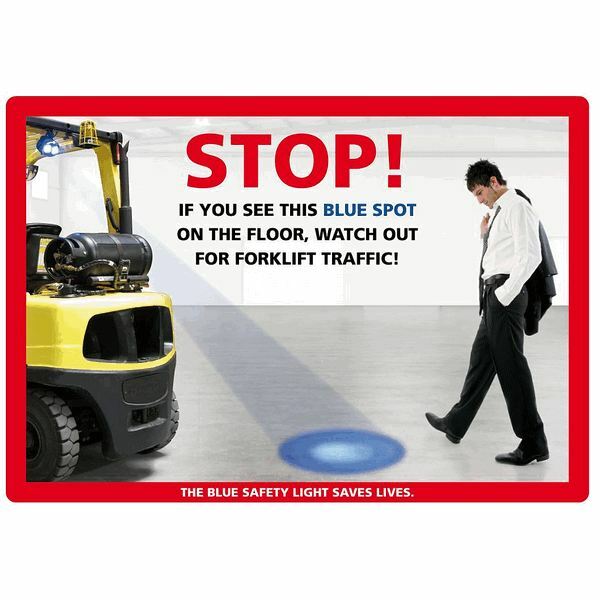 The innovative Bluespot® blue forklift light helps avoid forklift and pedestrian collisions. In the USA alone, there are 19,000 forklift/pedestrian accidents each year. Sure backup alarms are effective, but what happens when employees are listening to music, talking on cell phones, or staring at the ground? That's our blue forklift light can help! Install the blue light on the rear portion of the forklift's overhead guard. A focused beam of blue light will appear on the ground behind the forklift. We offer two different versions of blue light for forklift models. Heavy duty, tough construction. Metal housing, Weighs over 2 pounds (1 kg). These lights take a beating--you don't want to have to replace these things after a year! Our light is tough and will likely outlast the life of the forklift! Integrated wire harness-no additional cable required. UL Listed. If your forklift is UL listed you'll see a UL logo on your forklifts data tag like here If you install a non UL listed blue light on your UL listed forklift you run the risk of voiding your UL safety rating on your forklift. Lots in stock, ready to ship!